Alongside Fun! Fun! 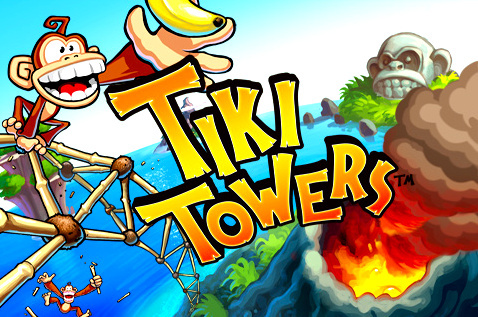 Minigolf, the next game to reveal its release date for the pre-Christmas slot of Monday, 22nd December is RealArcade’s Tiki Towers. The price point is confirmed to be only 500 Wii points. The observant among you remember that this was originally scheduled to be released last Monday, but for whatever reason that did not happen. Some might write this game off as a World of Goo clone as it is a construction themed puzzler too, but at a closer look it probably isn’t that similar. The idea is you have to get a group of five monkeys to a safe place by building bridges of bamboo, vines, and coconuts. The tricky part is the bridges sag and break under the weight of five monkeys crossing it. Not only do you have to get the monkeys from one place to another; you have to get them to grab the bananas hanging in various high spots, such as over lava pits. There is also a two player cooperative mode. A version of this game has already been released on mobile platforms and the iPhone version will be released on the 15th December we are told. For more information check out the official website or watch the video below to help you decide if you will be asking Santa for this game for Christmas. Lets hope this thread is better than the last Tiki Towers thread. As for the game, it looks okay. I probably won't get it though. I'd rather save points or by VC games. Looks like you Americans are having a happy Christmas, then! I wonder when we'll be getting this one? The question I would ask first is when are getting Boingz or have RealArcade joined the developers who have forgoteen about Europe? All I can hope is this doesn't disapoint like Boingz did. So does that mean it's a little bit of Lemmings as well? I was hoping that Cave Story would be ready by Christmas, but there hasn't been any news since November so I guess that won't be happening. They must have tried pretty hard, though. Does anyone know the chances of Europe getting World of Goo for Christmas? Thats what we all want! And what's happened to .x.supermario.x. and demon212 I've not seen those guys posting in ages! Looks like NA will have to wait until 2009 for the 2 most exciting (IMHO) games: Animales and Cave Story. I will admit that TT looks better than previosuly thought. @wiiware4trolls- x.supermario.x has a new account here. If you can't tell which, then you haven't been reading his previous posts enough. Its not fair that we don't have World of Goo yet. Finaly this game is comming out. I just hope we get Cave Story next week. I made fun of him once for liking that stupid "Let's Catch" game and he's been gone ever since. As for the Monday before Christmas, at least we have one good game that week. Fun! Fun! Mini-golf seems to be a bright spot in what otherwise is a WiiWare drought. Boo! Not another puzzle game! I want more action type games or a good sports game! Hopefully Fun! Fun! Minigolf will be that first good sports game. Fair enough. I think I'll start a new account as well, can't even remember why I chose this username anyway. The PC version is out in Europe now (Steam and Amazon.de...they're working on getting it to Amazon.co.uk) and the WiiWare version is going through the lot check and will be out as soon as it is approved. 2DBoy will post a date as soon as they know but given the PC version already being out it can't be long. x.supermario.x joined the carnival and has now worked his way up to Tilt-O-Whirl operator last I heard. Great to see his career really taking off. As for demon212, he's still around if you know where to look. Hey starwolf, was it you that was banned from wiiware channel? I'm banned as well.. (Well, it's not really banned... they just lock you in the last region you used, which is USA in my case..) Any way to get back to the EU region? @wiiware4trolls: WWW changed my name from WiiloveitOnline, so if there's anything you want, I'm sure they'd be happy to help, rather than you starting a completely new account. Also, 2D Boy stated that WoG should be out this month - so if you don't get it next Friday, it'll probably be out on the 2nd of January (although a Christmas present would be nice, Nintendo HINT HINT). @Corbie: are you sure? Last I heard, he decided to turn his life around due to AlexSays's hurtful comments, and in response he made a list of everything bad he's ever done, and he's making up for them one by one - before the idea gets boring and he ends up in prison and then a coma meaning that nobody cares any more. Or wait - was he the one working for ajira airways? I get mixed up. @Wesleyh: If you're talking about the homebrew thingamajig, I believe that was Starwolf, yes. "Looks like you Americans are having a happy Christmas"
On topic, this game doesn't look half-bad, but I want WoG in my virtual fridge-stocking-like-object!!! i bought the recently released kirby super ustar ultra and its amazing! This game looks pretty interesting, but I'll wait for the review before I pass too much judgement on it. Interesting game. It kinda looks like Mario vs. Donkey Kong 2. I think 205926 is the one that shows up. Looks like it could be fun, but the price is a bit steep considering that it's a cell phone game. I mean you can buy paper mario for that! This reminds me of Elefunk for ps3. It looks like fun but I think I'll wait for the review before downloading it. Demon212 hasn't posted here for ages but he's still making great video reviews. It was because of him that I even found WiiWareWorld. @SilentJ: I found Demon seperately, and I found this website a few days before the launch of WiiWare to get more info on the launch games. I coudlve sworn when Cave Story was revealed it was listed as a Q1 2009 date. Dont tell me Im the only one who obsessively read Nintendo's Fact Sheets! Reminds me of Mario Vs. DK 2: March of the Mini's and Lummies, should be good then. as long as the control is decent. I'm looking forward to reviewing this one. Here's hoping it's a good one! Thanks for the info guys! I really hope world of goo is out for christmas, not that i'll be able to get the rest of my family off mario kart anyway, but i'm still hoping. About demon212, i think he should make a comeback. With outrageuos comments like dr. mario is a poor man's tetris, picross is a glorified minsweeper and banjo kazoie was the game mario64 should of been. I think he is sorely missed, if only for comedic value. @Corbie. I heard x.supermario.x was demoted to the dunk tank, because he'd keep cranking the Tilt o' Whirl to max speed, and stole people's change as it flew out of their pockets. I heard he went on to become a successful male dancer but whatever. I saw World of Goo for the first time a few nights ago on my friend's computer. I was converted... Anywho, I'll keep my eye on this one. Doesn't look all to fun. Definately looks easier then WoG though. Not interested, I have WoG and is a good game but not my favorite one, so I don't think I'm gonna like this one. If Nintendo doesn't put a nice game on VC this 22nd it's gonna be a really meh christmas for me . HOLD THE PHONE: World of Goo has just been PEGI rated - almost confirming a release for this Friday. WOOPWOOPWOOPWOOPWOOP. I mean seriously Nintendo! What else are we meant to play this christmas holiday? Animal Crossing for the 3rd time? no thanks. Wii music? can't see it. I'm relying on WoG to entertain me after the festivities are over. Starwolf_uk; how about deleting the wii shop account and saying it was some retarded nephew who did this accidentally? That way they won't know that I used homebrew.. I'm really hopping that it's not too simular to WoG. I liked WoG I just don't wan't this to be too simular. By the way, I know I'm getting off the subject, but I just heard this Molly person was sueing Nintendo over their wrist straps. Anyone heard about that? Just ticks me off and I just wanted to say something. I really hope she loses the case. @longtimegamer: You mean this? That's stupid. Here's an idea for those thinking of starting lawsuits like these: don't swing your arms around like a looney, use smaller, more effective swishes and HOLD ONTO THE REMOTE. Oh, and similar isn't spelt simular. Nintendo is the biggest video game company in history and their gonna have some pretty BIG lawyers awaiting. As for this Molly character shes probably some 30 year old house mom whos kids most likely broke their TV playing Wii. Wiiloveit- oops! Thanks on the spelling. Yea, I don't even see how you can break one of these straps, unless it's frayed or something. I still have the old strap for one of my wiimotes and it seems sturdy enough to me. I'd like to know what REALLY happened. Also this lady claimed that when she recieved a new strap, that it wasn't any better. I don't believe that. @Shadows262- Am I kidding? Stupider things have happened. I think one of the kids that was playing with it was three. I wonder if her younger kid chewed on the strap string. I know my niece did this to a gamecube controller before, she was about 4. So it happens apparently. but if that happened then why is she sueing Nintendo? @Shadow262- Cause she want's to make money by blaming Nintendo, instead of taking responsibility for her own mistakes. I really don't see how anyone can possibly swing the wiimote with enough force to break the strap. Be cool if they tested that on myth busters. @ack- It's possible to fumble with it or even have it slip out because of sweat. I could see THAT happening. Though if someone takes off the straps and something happens it their own fault and noone elses. Although I don't use the straps on the Wii Remote myself, those who come over and play in front of my HDTV do wear them at all times. No exceptions. But I too have often wondered how someone could swing their Wii Remote so hard that it slipped out of their hand and crashed into their TVs. Some people must really get into it. @Corbie-Or they're lying about wearing the strap. I would imagine deleting the Wii Shop account deletes thier records as well meaning they've got nothing to restore Just ring them up and quote the error code. Here in the UK the repair process works as you send it in free of charge and if you need to pay a bill you have to pay it before the repair work is done. Refusing to pay just means they'll send it back. I have a feeling the error is 100% server-side (seeing as the only way out is to delete the records off the server) meaning they shouldn't need to send anything in but probably will anyway since they can't charge you otherwise. “sueing Nintendo” is one of THE worse things someone could do to make money. anyway the only game i can think of that can cause an accident like this is Wii Sport`s Tennis. Also: I actually have broken one of my old wrist straps (it snapped where it was fastened onto the remote). This was when I had one guitar hero guitar and a friend came round. I wanted to give the Wii remote controls a try so we could still play two player, but when the naff controls really started to bug me (right for green B for red, A for yellow, 1 & 2 for the others - try that on hard), I threw the remote down on the couch in rage, only for the strap to break. I "ordered" some newer ones though for free on the Nintendo website (as I'd also done a year before with the Wii jackets), and I must say that they're a damn site better - even though the clip isn't perfect. I agree that anyone that smashes their TV with it though obviously wasn't playing right in the first place, and those individuals should never be allowed near knives or sharp things - just in case. Does everyone else use the jackets? I just recently started using the jackets on my Wii Remotes. Although it felt weird at first, I've kinda grown to like it better now. @Starwolf_UK: I agree - they make the controller a bit chunkier and easier to hold. Also: if you're having trouble getting some, I'd send an e-mail to NoE, they were awfully helpful when I needed some extra wrist straps and my Wii Serial No wouldn't work in the form.